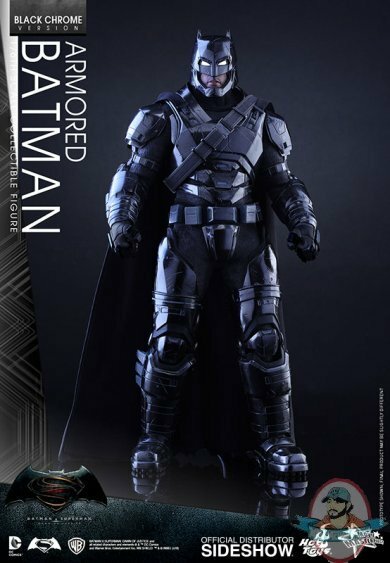 Since the release of the latest trailer, fans around the world are getting even more excited to witness the epic showdown between Batman and Superman in the upcoming Batman v Superman: Dawn of Justice debuting this month! 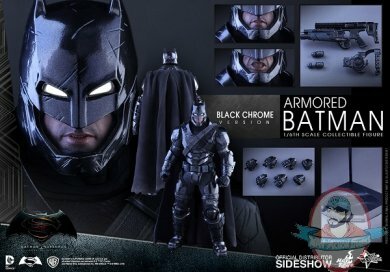 Sideshow and Hot Toys are very excited to officially present a special black chrome colored version of the Armored Batman sixth scale collectible figure to celebrate the movie launch! 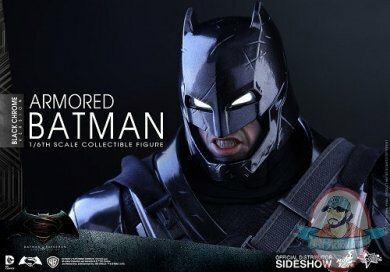 This collectible figure is only available in select markets and is specially crafted based on the image of Ben Affleck as armored Batman from the film, featuring an armored head with LED light-up eyes and two interchangeable lower faces, meticulously sculpted and a specially applied black chrome colored armor, detailed Batman weapons, and a Batman v Superman: Dawn of Justice themed figure stand. NO COUPONS OR DISCOUNTS CAN BE APPLIED TO THIS ITEM.Limited 1 piece per person.